What is the Coda Chrome extension? 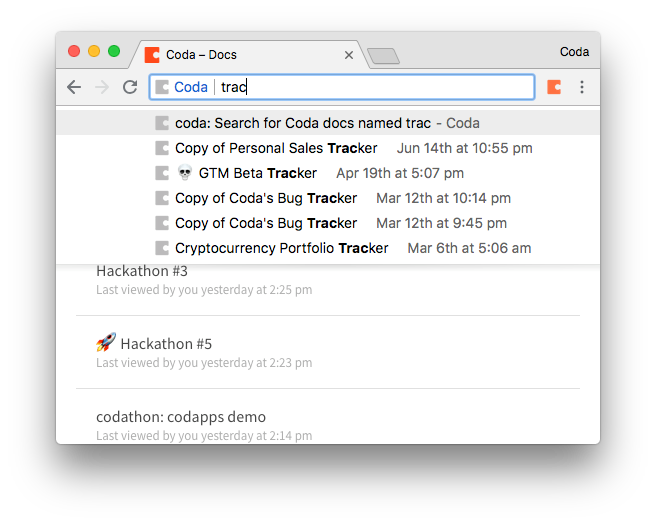 Coda for Google Chrome is a small Chrome extension we built to make using Coda in your browser even better. You'll be prompted to install it when you try to open the same Coda doc in multiple tabs. Coda docs can currently live in only one tab at a time. If you open a link to a Coda doc that you already have open, you'll be switched to its open tab and automatically get taken to the right spot. Try typing in "coda" in the search box and hitting <tab>. You'll be able to easily find your recent docs from anywhere in Chrome. Hit the Coda extension icon and you'll get whisked away to your Coda docs list. Keep your eyes peeled for future updates!